What is a Connecticut Month to Month Lease Agreement? Connecticut Month to Month Lease Agreement: What Is It? 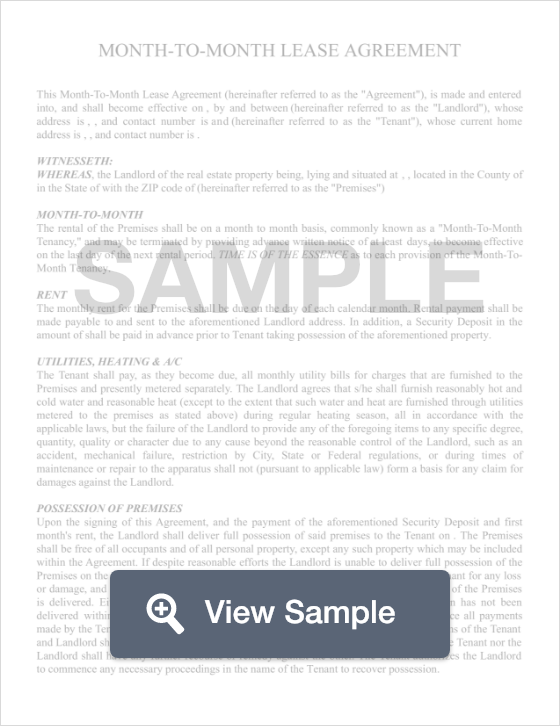 A month to month lease agreement in the state of Colorado is a legal document that landlords use to legally establish the agreement between a landlord and a tenant for a short period of time (one month). Generally, when the month expires, the contract renews automatically at the beginning of each month until either the landlord or the owner terminates the agreement. These agreements work well for tenants who may have a job that requires them to relocate often or for contractors who will work assignments in various locations for a few months at a time. For landlords, these types of agreements work wonderfully because they are not locked into a specific tenant for an extended period of time. If the landlord wanted to end the agreement, he or she would not have to break a long term lease in order to terminate the agreement. Although the state of Connecticut has no minimum that specifies the minimum notice that one party must give to the other to terminate a month to month lease, it is highly recommended that either party gives a 30-day notice to avoid any potential issues.